The total number of mortgaged residential properties with equity stands at roughly 90 percent (44.9 million), with 10.2 percent of mortgaged homes (5.1 million) nationwide underwater or with negative equity. 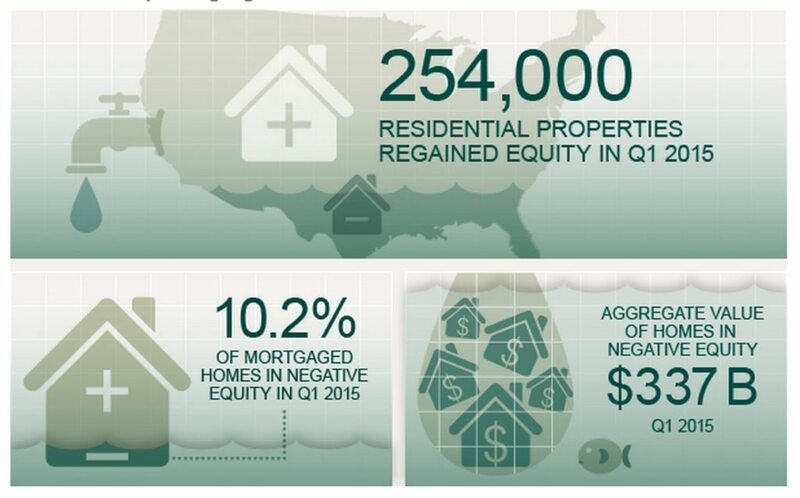 According to a recent analysis from CoreLogic, overall borrower equity increased year over year by $694 billion in the first quarter of 2015, with 254,000 properties regaining equity. It’s worth noting that 19.4 percent of borrowers with equity have less than 20 percent equity, and 2.7 percent have less than 5 percent. The bulk of positive equity for mortgaged properties is concentrated at the high end of the housing market. CoreLogic reports that 94 percent of homes valued at more than $200,000 have equity, compared with 85 percent of homes valued at less than $200,000. The overall equity improvement during the quarter means the volume of upside-down homes decreased — by 12.9 percent when compared with the first quarter of 2014. A 5 percent appreciation in home values across the U.S. would reduce the number of owners with negative equity by about 1 million, forecasts Anand Nallathambi, president and CEO of CoreLogic. Combined, these five states accounted for 31.4 percent of negative equity in the U.S.
Of the total $337 billion in negative equity, first liens without home equity loans accounted for 53 percent in aggregate negative equity, while first liens with home equity loans accounted for 47 percent.